Jonathan McMurray celebrates drawing Ballymena level in the first half. BALLYMENA United substitute, Joseph McKinney salvaged a point for the Sky Blues against 10 man Linfield in a lively encounter at a blustery Warden Street. Mark Stafford gave the Blues an early lead before Jonathan McMurray fired the home side level. Three minutes before the half-time interval, Andy Waterworth put L;infield back in the driving seat. The game turned on its head on 65 minutes when Linfield defender, ,Mark Haughey was handed his marching orders for a second bookable offence. Ballymena went for the jugular and McKinney came off the bench and earned his side a share of the spoils with a terrific strike from 20 yards. The Braidmen should've completed the turnaround from the penalty spot when McMurray was brought down but Kevin Braniff blasted over the bar on 81 minutes to spare Linfield's blushes. David Jeffrey's side had remained unchanged from the side which lost to Crusaders in the Co. Antrim Shield Final,. however, David Healy, as promised, rung the changes after the 3-2 defeat to Glenavon. Jordan Stewart, Jamie Mulgrew, Andrew Mitchell, Niall Quinn Waterworth and Stafford all made returns to the Blues' starting XI. The home side won the toss and opted to play with the strong wind on their backs in the first half as Linfield struggled to get out of their own half in the early stages in the blustery conditions. However when Kurtis Byrne kept alive Andrew Mitchell's free-kick, his cutback was slotted in from close range by Stafford to give the visitors an 11th minute lead. Steven McCullough attempted to get Ballymena level with a shot from distance on 18 minutes but it sailed harmlessly over. The Sky Blues were back on level terms on 26 minutes following a lovely exchange between Kevin Braniff and McMurray on the edge of the penalty area with the latter picking out the bottom corner of the net with pinpoint accuracy. Moments later and Stephen McAlorum did superbly to bravely head Mark Haughey's looping header off the line and behind for a corner. McMurray came close to a second for Ballymena on 35 minutes when he got in front of his man and flicked McCullough's near post cross over the crossbar with a deft touch. Linfield were back in front three minutes before the interval when, from a Kirk Millar corner, Stafford flicked it on towards the far post where Waterworth was left with the easiest of finishes. Linfield came so close to netting a third seven minutes after the restart when Byrne did well to find Stewart and drilled his volley across the face of goal and wide. 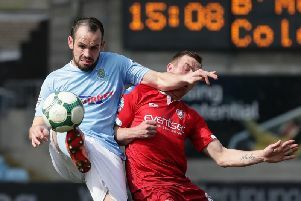 The visitors were reduced to 10 men on 65 minutes when Haughey was shown his second yellow card in the space of eight minutes for a trip on Ballymena substitute, Cathair Friel. Ballymena drew level 11 minutes later when the ball broke to substitute, McKinney on the edge of the Linfield penalty area and he drilled his shot expertly into the bottom corner. The Sky Blues were gifted a glorious chance to take the lead for the first time in the game with 10 minutes to go when McMurray was brought crashing to the ground by the challenge of Jimmy Callacher. Up stepped Kevin Braniff to take the spotkick but the striker blasted high over the crossbar as the Braidmen had to settle for a well earned point. Ballymena Utd; R. Glendinning: J. Ervin, K. Owens, K. Balmer, S. McCullough; M. Shevlin, Stephen McAlorum, A. Kane (J McKinney 73), W. Faulkner (C. Friel 62); J. McMurray, K. Braniff; Subs Not Used - E. Friars, F. McCaffrey, C. McCloskey. Linfield: R. Carroll; M. Haughey, J. Callacher, M. Stafford, N. Quinn; K. Millar, J. Mulgrew, A. Mitchell, J. Stewart (S. Lowry 70); A. Waterworth, K. Byrne (J. Robinson 67); Subs Not Used - L. Rooney, R. Garrett. B. Adams.